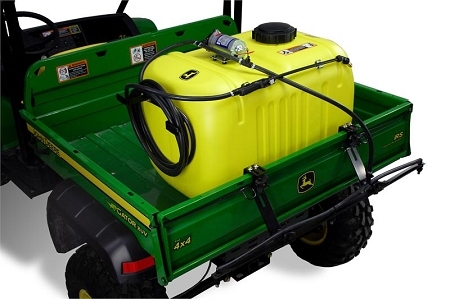 This 45 gallon sprayer is compatible with all Gator T, HPX and XUV models with steel cargo boxes. It provides an excellent way to apply spray materials such as liquid fertilizer, weed killer, tree spray and de-icer. It comes complete with a 43" boom that sprays a 120" swath. It's equipped with a 19-foot hose and a spray wand for spot spraying lawns, shrubs, trees, etc. The fully adjustable brass spray wand tip achieves streams up to 30 feet. It has four rubber feet bolted to the bottom to protect and stabilize the sprayer and custom mounting brackets for a NO TOOLS mount. Great product. 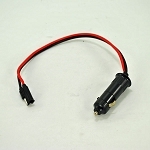 Extremely easy to use and operate. Perfect for a small farm to maintain weeds and fertilize pastures. Saves a lot of time. Wish I had bought this years ago. Work great. Only issue was two missing 5/16 X 1.25 flange bolts in the parts bag. They were all 3/4"